Maternity clothing that's stylish and functional? Yes! The goodbody goodmommy cardigan is perfect for pregnancy, breastfeeding—and beyond. 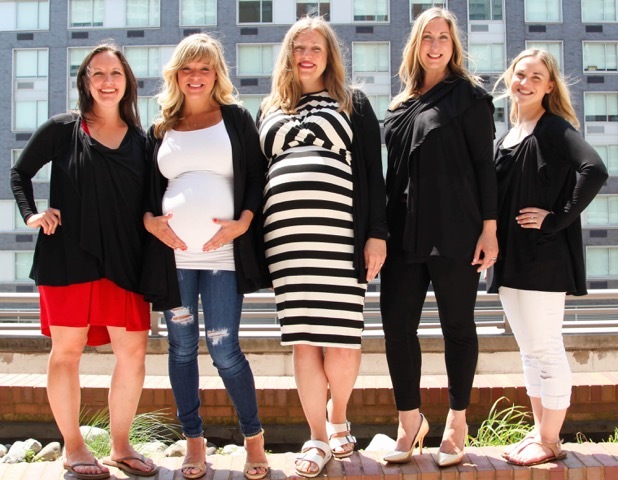 The Full Belly Sisters are proud to share a our buddy's new venture: goodbody goodmommy maternity clothes. They're fashionable and functional, they fit flawlessly—and they'll transition long past your pregnancy. And they're made in the USA (in our hometown of New York City. Holla!). 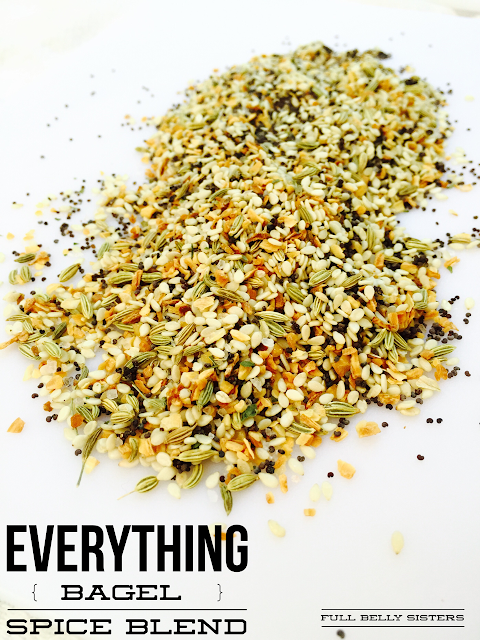 This isn't a sponsored post; we just want to share a great product created by awesome moms. Goodbody goodmommy is made up of a mom-midwife duo who believe getting pregnant doesn’t need to be a fashion death sentence. We blend trend-worthy styles with strategic support and functionality to ensure every piece we make not only looks good, but works with your changing body and its changing needs. We have pored over every detail of our carefully-designed garments so that they will transition through pregnancy and beyond. Our pieces are fashionable, functional athleisure items that offer comfort and support while working out, segueing right to a stylish brunch with friends, or wherever your busy momlife takes you! With our first garment, the goodbody goodmommy cardigan now on the market, we couldn’t be more grateful to the Full Belly Sisters for the opportunity to introduce ourselves to you! Hello, loves! The goodbody goodmommy cardigan is a gorgeous blend of model jersey and spandex that boasts a full design that looks great with your athletic leggings, jeans and even a dress. You can wear it during your pregnancy but, unlike most maternity clothes, this will stay a wardrobe staple after you meet your baby to ensure you get the most from your investment. 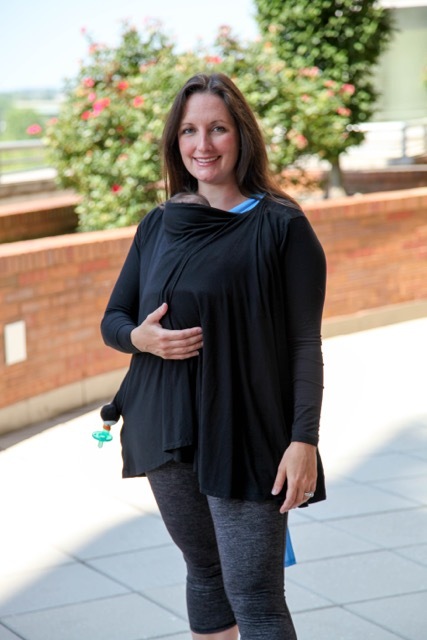 It transitions to a cover for nursing or baby-wearing by using our easy button-loop system. It was designed with a non-maternity size base so it can continue to be worn beyond your pregnancy and nursing experience. This cardigan is manufactured with love in The Bronx. goodbody goodmommy was born when Erin Howard, an avid marathoner, couldn’t find running clothes with the fit and support she craved during her pregnancy. She elicited the help of Melissa Peard, a midwife in NYC with a love of spinning and fashion. Their passion can be summed up best by what co-founder Erin said at the beginning of this journey: “As a mother, I want to look at my daughter and tell her she can do anything!” goodbody goodmommy is here to give you the clothing you need to do it all. We know everyone’s journey through pregnancy and after is different. We support you literally and figuratively on your path, wherever it may lead. The goodbody goodmommy cardigan multitasking cardigan is now available for $59. Athletic leggings (with and without supportive belting) are in the works and coming soon. We hope you love the garments we have created for you—and we look forward to hearing from you! For more on goodbody goodmommy, follow them on Facebook and on Instagram.